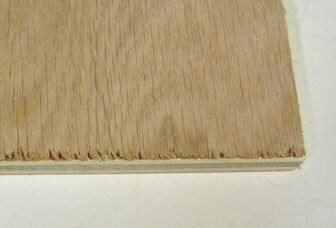 When cutting veneered or melamine coated plywood or particle board on the table saw, there is always the problem of tearout at the bottom. Tearout can be reduced by cutting more slowly, setting the blade relatively low, and by the use of a zero clearance insert. But even with these measures, some amount of tearout still happens. Some people avoid tearout by putting tape over the area to be cut, but that is time consuming and messy. 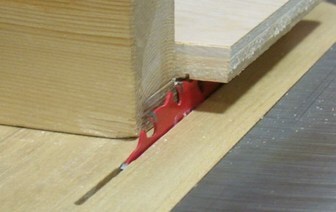 On high end table saws, this problem is solved by the addition of a "scoring blade". The scoring blade turns in the opposite direction to the main blade, so that it cuts with the teeth cutting into, not out of the wood. The scoring blade cuts a shallow cut ahead of the main blade, so that the main blade's teeth, where they exit the wood, end in the cut that was already made, so that they don't pull the fibers out of the surface. One can always emulate this behaviour by manually making a scoring cut. This can be done by setting the blade so that it cuts only 1 mm into the material, and running the stock over the blade backwards. This should only be done if the stock can be securely held, such as on a crosscut sled. The scoring cut should only be about a millimeter deep, so that there is not enough for the blade to grab hold of, as cutting backwards across a sawblade is generally not the safest thing to do. But I know a scoring blade on a high end table saw does exactly that, so it can be done safely under the right circumstances. After making the initial scoring cut, without removing the stock from the sled, the blade is raised to cut through the material, and another pass is made forward.